Ian Clark is a man of many talents. He is a chef, a brewer, an ice cream artist, a gardener, a beekeeper, and a modern-day MacGyver. He attended the New England Culinary Institute and went on to work in acclaimed restaurants across the country before falling in love with Boulder. After years honing his culinary techniques in the kitchen and devoting endless hours to his home brewing passion he started his entrepreneurial career by opening a brewery, BRU, from his garage. BRU quickly moved and expanded to its full gastro-brewery glory, where he brings both his passion and knowledge of food and beer under one roof. Ian then opened Heifer and the Hen, an organic creamery right next door to BRU. At Heifer and the Hen, he brings that same enthusiasm and his culinary palate to ice cream, mixing up dreamy concoctions like burnt honey and mint basil with bitter-dark-chocolate chunks. 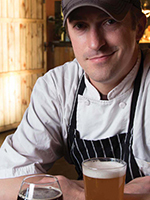 Ian has also won numerous awards and accolades over the years for his cooking, brewing and ice cream, including a national TV appearance on the Cooking Channel’s “Unique Eats,” the silver medal at the 2014 Great American Beer Festival for his LOCH Wee Heavy Scotch Ale, Best Brewpub from Westword, a spot among the “6 Beer and Food Innovators” named by Draft Magazine, the Ten Best Ice Cream Shops in Denver via Westword and 15 Unique Ice Cream Shops from Afar Magazine. Wake up and go on a run along Cottonwood Trail with my dog Maddex. Once back at the house, make a fresh pot of Dragonfly coffee, then head to the garden and pick breakfast for my wife, Bryce, my son, Alden, and me. Make some sandwiches with meats and cheeses I picked up at Cured on the east end of Pearl Street and a few tomatoes fresh from the garden. Pack up a couple of Upslope craft lagers and the paddleboards and head up to Gross Reservoir for a little paddle boarding with my wife and son. Get on our bikes and head to BRU handbuilt ales & eats for dinner. I always go for the fried chicken and Citrum IPA...hard to go wrong with that combination! Swing next door to Heifer and the Hen for an ice cream cone (I’m a sucker for ice cream, especially our Vietnamese coffee or raspberry shortcake). Cap off the evening with a fire on the patio at our house drinking a gin cocktail with gin from Vapor Distillery (Ted makes the best gin), and relish in stories about how great the day was.